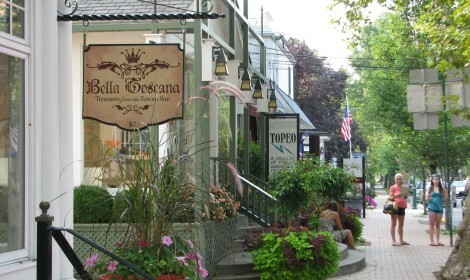 It’s easy to use the word “bustling” to describe New Hope, since the village is so alive with galleries, specialty shops, casual and fine dining, and theater. People travel from Philadelphia, New York City and beyond to spend the day shopping and dining at what started out as an early industrial town. New Hope was bustling back in the late 1700s, too. By one 1798 account, there were “34 buildings and dwellings,” including “stores, shops, barns, a tavern, stables and saw mills.” It would have been a metropolis compared to other settlements up and down the Lehigh and Delaware rivers. The town boasted a variety of mills, ranging from grist and lumber to those that produced flour and processed flax. In the 1820s, cotton spinning and weaving joined the list of local businesses when facilities opened on the banks of the Delaware. Veterans from both the American Revolution and War of 1812 called New Hope home, and houses dating back to that era line the streets . Most of the oldest houses are on Ferry Street. On the south side of the street is an old stone house once owned by Major Edward Randolph, a patriot of 1776. Along Main Street you’ll find a handsome stone mansion built by noted civic leader Benjamin Parry. It took three years to complete, and today the 1784 Parry Mansion stands as a fine example of 18th century architecture. The house is open for tours that highlight 125 years of decorative changes from 1775-1900. Parry also had a hand in building the first bridge that linked New Hope with Lambertville across the river in New Jersey. Along with businessman Samuel Ingham, Parry, in 1812, received legislative permission to construct a covered wooden bridge with six spans. The project took two years to complete, and in the end the cost of constructing the bridge and toll booths, plus purchasing ferry rights, totaled $48,000-a king’s ransom back then. In 1841, a floor destroyed a portion of the bridge. In 1903, the New Hope side of the old wooden bridge was so damaged by another flood that it was replaced by an iron structure. The canal brought life and energy to New Hope, as was the case elsewhere along its route. In 1882 one resident wrote in a letter that “a great deal of coal is coming down.” By some accounts, in the late 1860s an estimated 100 canal boats a day passed through New Hope. During the 1920s and 30s, the village, nearby hamlets and farms became a flourishing art colony. By the mid-1900s New Hope had become a popular resort, a stopping point for plays bound for Broadway, and home to New York and Philadelphia artists, musicians and writers. So many artists had worked in and around the town that the New Hope School of Pennsylvania Impressionists was born. Today, the theater and art scene help draw more than a million sightseers a year, many choosing to ride the mule-drawn canal boat (more info below) and refurbished New Hope & Ivyland Railroad with its steam locomotive and antique coaches. Displays at the 19th-century Locktender’s House, located at Lock No. 11, depict canal workers and their families at work and play.